A month ago, if anyone were to inquire whether I liked moussaka, I likely would have responded with a “Moose-a-what?” Generally, I enjoy learning about various popular dishes from all around the globe, but this dish must have slipped past my radar. So when one of our Thanksgiving dinner guests (who wishes to remain anonymous) mentioned that she was bringing moussaka as her contribution, I immediately “googled” the dish to learn about it. The exact origin of moussaka is unclear. Some claim it as a Greek dish (it is quite popular in Greek cuisine), but there are variations throughout the Mediterranean, including Turkey and the Balkans. (according to Wikipedia and other sites) Despite the countless variations, most recipes include a handful of principal ingredients: eggplant (aubergine), tomatoes, onions, and a crusty, creamy layer on top, usually comprised of a bechemel sauce. (Bechemel is a white sauce, usually made of a flour/butter roux and milk or cream.) Unfortunately for me (and a great deal of other celiacs), bechemel sauce is a deal-breaker. So when the moussaka arrived at Thanksgiving, I grilled (as politely as I could, of course, but a gluten-free girl’s gotta know whether she can dig in!) the “cook” about the ingredients she used. As she rattled off the (rather short) list of ingredients, (eggplant, tomatoes, onion, parsley, lamb, yogurt, egg…) I quickly discovered that I would be able to try this delicious-sounding dish! And delicious it was – bursting with savory and rich flavors. It seemed impossible how tasty it was – the dish was indeed more than the sum of its parts. I immediately cast aside all class and grace – I begged for the recipe. I brought up the subject more than once during the remainder of the evening. Not that I really needed to – she already agreed to send it to me. In retrospect, I probably annoyed the hell out of her. In any case, she emailed me the recipe, so my shameless begging did the trick. I jotted down the ingredients needed on my grocery list for this week, and in spite of the lengthy time to prepare the dish (it takes a little more than an hour, which is usually more than I’ll tackle on a weeknight), I made plans to make this last night. Let me tell you, it was so worth the wait! The yogurt-egg-cheese topping was beautifully browned with just a bit of a crunchy edge. 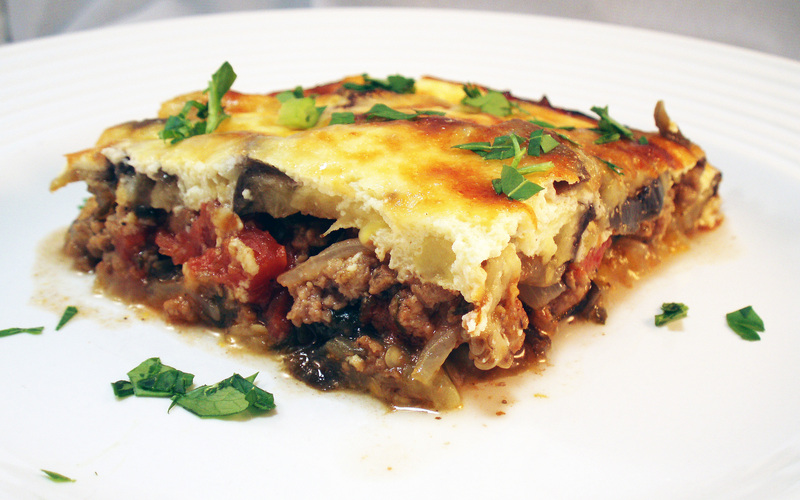 The eggplant layers melded flavors with the lamb and tomato mixture to create a savory, luscious, satisfying filling. I couldn’t help myself – I had to have seconds. And some more for lunch the following day. This was one of those times where I wasn’t too sad that my husband isn’t a fan of eggplant or tomatoes – it just meant there was more for me! This is the perfect dish for company. If you wish, you can prepare it up to 3-4 hours ahead of time, waiting only to bake it when your guests arrive. It will make the house smell heavenly. You can always round out the meal by adding a garden salad or a potato dish, if you choose. Lay the eggplant slices in a single layer over paper towels. Lightly salt both sides of eggplant slices and allow to sit for 20-30 minutes. Pat dry. Heat a skillet to medium-high heat. Brush a very thin layer of olive oil on each side of each eggplant slice. Add eggplant slices in a single layer in the skillet and brown on both sides. Set aside. (You will have to do this in batches) Repeat with remaining slices. Add lamb to skillet and brown for 5 minutes, crumbling with spatula and stirring as needed. Season with salt and pepper. Add the onion slices and garlic and saute for another 7-8 minutes or until onion softens. Add tomatoes and parsley and bring to a boil. Quickly reduce to a simmer and allow to cook for 15-20 minutes, stirring occasionally, until everything is completely tender. Taste and add salt and pepper as needed. 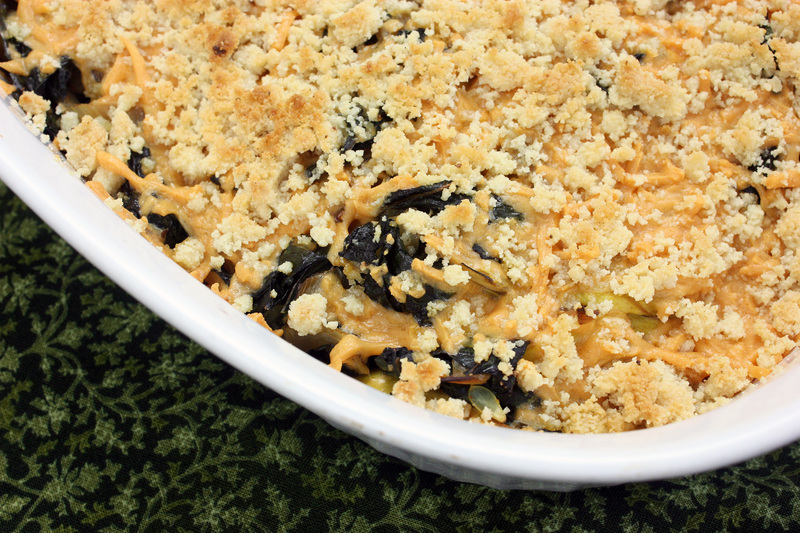 Arrange half of the eggplant slices in a single laer in an oven-proof 13X9 baking dish. Add the lamb-tomato mixture, and then layer the remaining eggplant slices on top. Beat the eggs in a bowl until doubled in size and foamy (I used my stand mixer for this). Add yogurt and continue beating until the entire mixture is fluffy. Add salt and pepper to taste. Pour egg mixture over the eggplant slices, spreading out in an even layer. Sprinkle Parmesan on top. Bake in a 350 degree oven for 40-45 minutes or until golden brown on top. Serves 4. Draining yogurt results in a thicker consistency, much like Greek-style yogurt. Line a large bowl with several thicknesses of cheesecloth. Place the yogurt into the cheesecloth, then gather the ends and fasten them tightly with a rubber band. Hang the cheesecloth over the bowl, allowing it to drip the excess water into the bowl. (I suspended mine over the bowl by wrapping the ends of the cheesecloth around a chopstick and placing a binder clip to secure. You can also hang the cheesecloth over a cupboard knob and place the bowl underneath.) Allow to drip for at least 30 minutes, or longer if you want an even thicker yogurt. Tasty Eats At Home turns 1 year old today! I cannot believe how much my blog has changed in the past year. When I decided to start this blog in 2008, it was a rather impulsive decision. I was rapidly becoming passionate about food and cooking at the time, reading anything and everything “food-related” that I could. I recently had become aware of Elise’s blog at Simply Recipes (the only food blog I was aware of at the time), and was impressed by her vast collection of recipes, mostly from her family. I thought to myself “What a great idea. I could share my recipes with my family and friends!” And with that, Tasty Eats At Home was born. Little did I know of the vast food blogging community that existed! Since Tasty Eats At Home’s birth, I have created 84 posts (this will be #85). But more than mere numbers, these posts represent a lot of things to me. I debated a few weeks ago on whether or not to keep all of my posts. Some of the earliest recipes I am no longer terribly fond of, and some are without photos. Of those early posts that do have photos, they are not exceptional by any stretch. But after some consideration, (and some tweeting about it on Twitter!) I have decided to keep them all. Each post represents a moment in my life, and together, they represent the growth in my cooking abilities, my photography, and most of all, my writing. As frustrated as I can be at times when the photography just won’t work for me, or the right words just won’t come, I can look back and realize that Tasty Eats At Home is in a continual state of growth, and for that, I am proud. Of course, Tasty Eats At Home would not be what it is, if it weren’t for the amazing support I have received. My husband constantly brags about Tasty Eats At Home to everyone he encounters, and that warms my heart. He is also my #1 critic of the dishes I prepare, helping me to grow and stay focused. My family is more than happy to help eat the dishes whenever they can as well, and critique accordingly! And to all of my fellow food bloggers – I can’t thank you enough for all the advice, recipes, and ideas we’ve shared! But lest you all think I’ve gotten a big head, I wanted to share with you a recipe that in my mind and heart, brings everything back down to earth and close to home. Ladies and gentlemen, I give to you: Surprise #7. Last night, I re-created this dish for our family. It is a very adaptable recipe. My version added frozen corn, and I used tomato puree rather than Dad’s choice of chopped tomatoes (I have some picky eaters in my household that will not eat tomato chunks). I also substituted brown rice for Dad’s white rice. 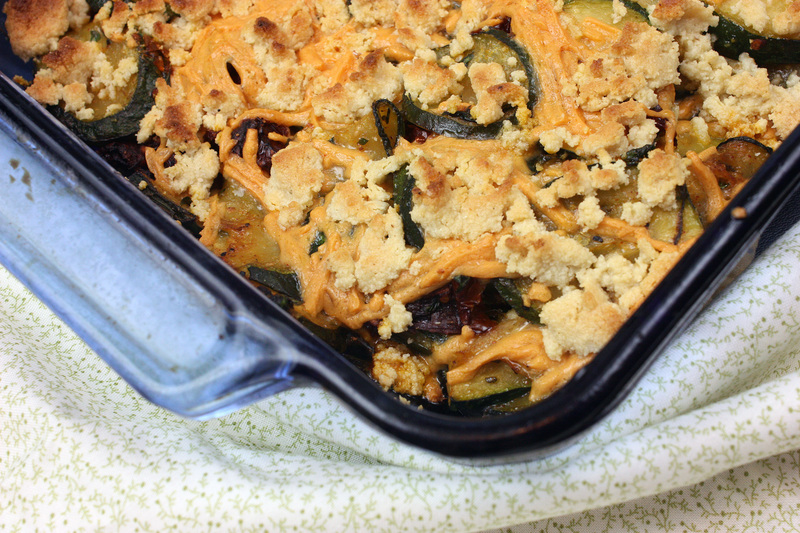 It’s a tasty, no-frills, comforting dish that is quite kid-friendly, and with a few pantry staples on hand, can be thrown together in very little time. Perfect for feeding a hungry family on a budget – no wonder Dad created it! Sometimes, re-visiting a dish from your childhood can invoke a lot of thoughts and feelings. Surprise #7 caused me to really think about Tasty Eats At Home and what cooking and food means to me, and so many of us. Cooking is an art, an expression, if you will. We all need food to nourish our bodies, but cooking allows food to become more than just a requirement – it morphs into an enjoyable, pleasureable experience. So we share the joy of cooking with others, with our friends, with our families, and it becomes a form of togetherness, and a way of connecting with one another. Creating Tasty Eats At Home has given me a way to more deeply connect with the joy that cooking brings to me and my family. Heat a large, heavy skillet to medium-high heat and add olive oil. When oil is hot, add onions, and saute for 3-4 minutes or until soft. Add garlic and saute for another minute. Add ground beef, breaking into small crumbles with your spoon or spatula, and cook, stirring occasionally, until browned. Add tomato sauce and chili powder, and stir. Simmer for 3-4 minutes, and add beans and corn. Continue to cook, stirring occasionally, for 3-4 minutes more or until everything is hot and your corn is cooked through. Add pickle juice and rice, and stir to incorporate. Salt and pepper to your liking. Optional: serve with cheddar cheese sprinkled on top. Serves 5-6, or maybe only 4 if you have hungry teenage boys.